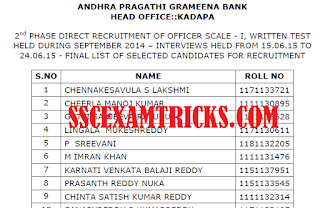 Andhra Pragathi Grameena Bank (APGB) had declared 2nd Phase Final Result / List of selected candidate of the direct recruitment for the post of Officer Scale 1 on 05th July 2015 on official website www.apgb.co.in. In the 2nd Phase Final Result/ Final Selection list, APGB has selected 163 candidates for Officer Scale I for the various department of Bank. The 2nd Phase final selection list contains name and roll number of the candidates. APGB 2nd Phase Final Selection list of Officer Scale I is available in PDF File. You are waiting for APGB 2nd Phase Final Selection List 2015, you can download Final selection list of 2nd Phase from direct link given below. APGB Officer Scale 2015 Final Selection List Declared: The 1st Phase of Final Result / Final Selection list was declared on 20th February 2015. The final selection list of the candidates is prepared from the marks obtained by the candidates in written test and personal interview. The written test was held in September 2014. Those candidates who had qualified and scored more than cut off marks, were called for personal interview. The personal interview was held from 15th June 2015 to 24th June 2015 for 2nd Phase of recruitment for the post of Officer Scale I. The interview was held at Andhra Pragathi Grameena Bank, Head Office, Opp.Officers’ Club, Near Murali Theater, Rayachoty Road, KADAPA – 516001, AP. The 2nd Phase final selection list for APGB Officer Scale I have declared now. APGB 2nd Phase Appointment Letter 2015: The 2nd Phase Selection of the candidates is provisional. The appointment letter will be sent to these finally selected candidates for APGB Officer Scale I Posts. You are required to verify your original documents and caste certificate for reserve candidates at the time of appointment/ joining to the final allotment / station of allotment. In case you have any queries, you may contact to HRD & IR Department of APGB Head Office, at Kadapa over phones 08562 250137 & 222016.